DOT, Gösteri Sanatları alanında çalışan bir kurumdur. Seyircinin güncel ve toplumsal konular üzerinde düşünme ve sorgulama dinamiğini canlı kılmaktır. DOT, sanat yönetimi, prodüktörlük ve mekan yönetimi yapar. Zamanın Ruhu ile ilgilenir ve çağdaş tiyatro metinlerden repertuar oluşturur. Repertuar seçiminde temel prensip şehirli insanın hikayesini anlatmaktır. Kendi repertuarı ve kendi mekanları için oyun prodüksiyonları yapar. Yurtiçi ve yurtdışı kurumsal ortaklık projeleri geliştirir ve uygular. Kendi sahnelediği oyunları, kendi yönettiği sahnelerde seyirci ile buluşturur. 2005’de DOT’un Ana Mekanı, İstiklal Caddesi Mısır Apartmanı’nda açıldı. 2011’de DOT’un Ana Mekanı, Maçka G-Mall’a taşındı. 2015’te DOT’un Ana Mekan, Kanyon’a taşındı. Dot’un Kanyon’da hazırladığı yeni tiyatro mekanı projesi DOTKANYONDA olarak isimlendirildi. verilen ödülü 2005-2006 sahnelediği tüm oyunlarıyla aldı. Cem Yılmazer – Nefesinizi Nasıl Tutarsınız? İbrahim Selim – Bunu Ben de Yaparım! DOT is an independent contemporary theatre company, co-founded in 2005 in Istanbul by Murat Daltaban, Özlem Daltaban and Süha Bilal. DOT’s first venue was opened in October 2005 at the Mısır Apartment in Istiklal Street. DOT has been delivering high voltage theatre productions to the Istanbul audience in its own venue for twelve seasons under the artistic direction of Murat Daltaban. DOT produces a wide selection of plays from various countries and cultures to integrate a critical eye to the arts and cultural scene and enliven the debate on current and global social issues. DOT works in artistic direction, production and venue management. Dot is artistically concerned with the spirit of the age. Innovative adaptations of contemporary texts form the repertoire. Underlining the repertoire is the story of the urban dweller. Dot produces plays for its own repertoire and venue. Dot is open as co-producer to partnerships with international festivals and/or institutions. Dot presents its audience self-produced shows in its self-managed venue. In 2005 DOT’s first venue was opened at the Mısır Apartment in Istiklal Street. In 2011 DOT‘s main venue moved from the Misir Apartment to Macka G-Mall. In 2015 the main venue was moved to much bigger and newly built space at Kanyon. DOT‘s new venue in Kanyon was named DOTKANYONDA. 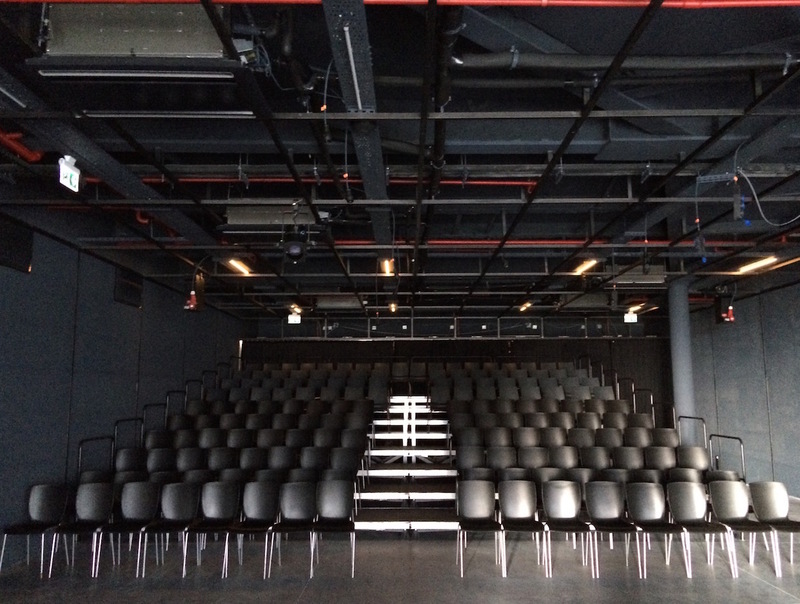 The Bilsar Building, located in Istanbul’s Tunel area, was transformed into a theatre space for Dot. Mark Ravenhill’s SHOOT / GET TREASURE / REPEAT consisting of 17 short plays and 1 radio play was prepared for the space. The Dotatbilsar Project began in September 2008 and ended in June 2009. In 2009, a new theatre space was created for Dot at G-Mall, a cultural centre located in Macka, Istanbul, with the support of The Mars Entertainment Group. The Dotatmars Venue Project went on for 5 seasons and ended in January 2014. FESTEN / KUTLAMA premiered January 22nd through the collaboration of DOT and KOLEKSIYON. The play was staged at the Koleksiyon Campus in Sariyer. The project ended in June 2011. Staged at the 15th International Istanbul Theatre Festival and 4th International Theatre Olympics. SHORT PLAYS FROM THEATRE UNCUT ISTANBUL WERE READ DURING THE EDINBURGH FRINGE FESTIVAL AT THE TRAVERSE THEATRE AUGUST 18TH. Dot Theatre with all productions. THEATRE UNCUT was started in Great Britain by project directors Emma Callander and Hannah Price in 2010 with a simple idea. They asked playwrights to write short plays about the current political situation. In the first three years of THEATRE UNCUT playwrights from England, Scotland, USA, Argentina, Spain, Greece, Syria, Iceland and Egypt joined in and the plays were staged in 17 countries. The project received awards from the Edinburgh Fringe in 2012, Fringe First, Herald Angel and Scotsman Spirit. DOT staged 15 selected plays from Theatre Uncut as “MAKAS OYUNLARI” in the 2013-2014 season in Istanbul. Playwrights participating in the “THEATRE UNCUT ISTNABUL” project, which began with a week long workshop in February in Istanbul and was realized with a DOT – THEATRE UNCUT collaboration are Davey Anderson and Stef Smith from Britain and Ayfer Tunç, Berkun Oya, Hakan Günday and Derem Çıray from Turkey. Murat Daltaban, Emma Callander and Hannah Price are directing the readings in Istanbul and Edinburgh. First readings of “THEATRE UNCUT ISTANBUL” were done May 16, 17 and 20 May for the Istanbul Theatre Festival. The plays will be read at The Edinburgh Fringe August 18th 2014 at the Traverse Theatre. From June 26th to July 2nd 2011, British playwright Leo Butler came to Istanbul for a playwriting workshop with Dot artistic director Murat Daltaban and novelist/playwright Hakan Günday. The Workshop focused on the development of a text from scratch as a collaborative effort involving the director, the playwright and the actor. Mr. Butler also performed a single day extra workshop with members of the Dot company about the principles of basic playwriting. The workshop enabled Hakan Günday to produce a complete play and also sparked great interest for playwriting and text development not only at Dot but also in the literal and theatrical community in Istanbul. DOT’s BRITISH PLAYWRIGHTS TALK AT DOT panel series realized with the support of THE BRITISH COUNCIL met with the audience in the 2008/2009 season. To initiate contemporary playwriting and the production of new contemporary plays in Turkey, Dot called on playwrights/emerging playwrights of all ages. The project was supported by Das Schauspielhaus Hamburg, Istanbul Goethe Institut and the Cultural Office of the Austrian Embassy in Istanbul and attended by 69 playwrights with 80 plays. The 11 selected playwrights were called to attend a playwright’s workshop led by the noted young Austrian playwright Bernhard Studlar in 12-18 February 2007. The 11 new short plays, written during the workshop, were read by professional actors at Dot in May 2007. The Talks were done under the title “Dot Meetings March 27th” for World Theatre Day, in the form of 7 different meetings with 6 moderators, from March 27th to 31st. Discussions were held on theatre bringing together performance artists, film and theatre directors, novelists, festival directors, contemporary artists, cultural operators, academicians and audience members, it’s place in today’s preferences, it’s relation to governmentDynamics subsidized establishments, it’s relation to the media, the say cultural policies have in change, it’s relation to the European Union, it’s push in transformation, it’s progress through civilian enterprise and what is taking place in the world currently. 500 people watched the meetings with 35 speakers. -What’s the deal with Theatre? -Where is Government Subsidized Art Heading? -What’s Happening in the World? To introduce new plays and playwrights from different countries a reading of Woman from The Past (Die Frau von Früher) was done April 2007 in collaboration with The Goethe Institute. The play was read by Uğur Polat, Murat Daltaban, Tülay Günal, Güneş Berberoğlu and Mine Tugay. Playwright Roland Schimmelpfennig attended a discussion with the audience after the reading. 2007 – International European Festival Projektion Europa, in Hamburg, Germany. 2009 – Dot has performed for the Transeuropa Festival, in Hidelsheim, Germany.